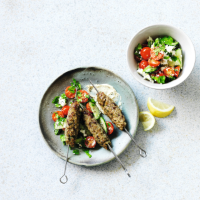 Better than a takeaway, these home-made koftas are lightly spiced and juicy. The ideal sharing meal, put everything in the middle of the table and invite people to help themselves. 1. Place the bulgur wheat in a small pan, cover with cold water, bring to the boil and cook for 5 minutes until the tender, then drain well. 2. Place the lamb in a food processor with the bulgur wheat, onion and garlic. Add the cumin, coriander, Craisins and half the parsley. Pulse until combined, then divide into 12 equal portions. 3. Preheat the grill. Take a portion of the mixture and press tightly round a skewer to form an oval. Repeat to make 12 skewers. Place on a grill pan and grill for 10 minutes, turning until nicely browned and completely cooked through. 4. For the salad, place the cucumber, tomatoes, feta and mint and remaining parsley in a bowl and toss gently. Stir together the lemon juice and olive oil and drizzle over. Serve alongside the koftas. Delicious served with a spoonful of houmous or Greek yogurt. If using bamboo skewers, soak in warm water for 15 minutes before cooking to prevent the skewers from burning.